If there was ever any doubt that 2018 was a bear market’s year for crypto, the average daily change should certainly clear those doubts. 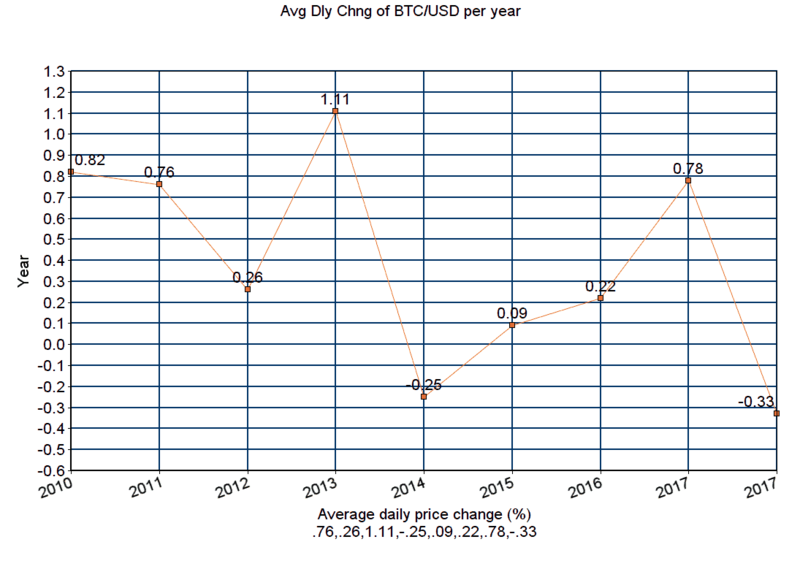 Yes, there is still one more day to 2018, but so far in 2018, it turns out that Bitcoin has experienced a negative average daily value change of –0.33%, which is the lowest in 9 years of value recording and the only second year for a negative change along with 2014 (-0.25%). What’s also interesting to observe is the daily value change of the years before 2014 and 2018. We’ve discussed in the past how the 2018 bear market shows a lot of resemblance to the chart of 2014. Remember that an asset which declined by 0.33%, needs around 0.5% to return to its initial price (for example if Bitcoin worth $1000 and lost 33% to $666.67 then it needs to raise by 50% now to raise back to $1000). The post 2018 Marks The Lowest Average Daily Value Change for Bitcoin In 9 Years appeared first on CryptoPotato.